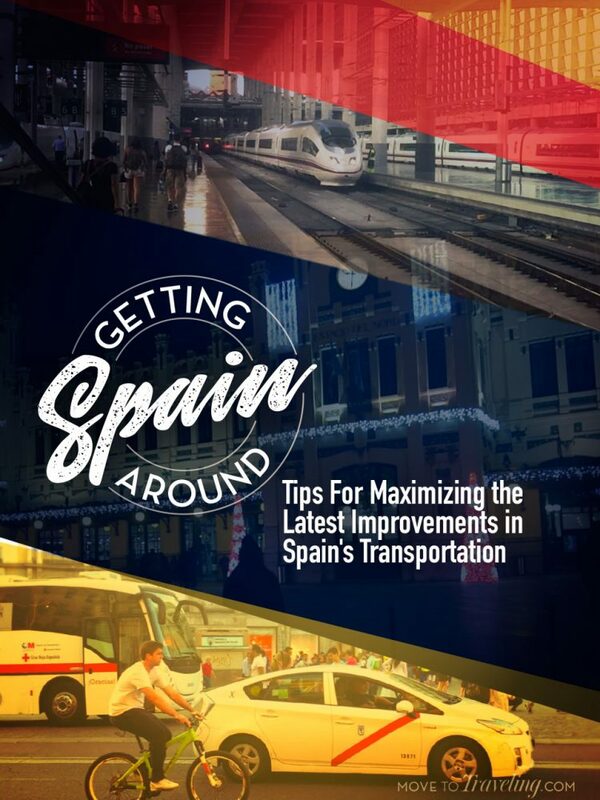 Getting around Spain today is easier than ever before. Even recently, the World Economic Forum rated Spain’s infrastructure as the tenth best in the world. Since living here, we’ve seen first-hand the progress that’s been made, especially regarding the improved online access to essential information, purchasing tickets and other great features. Traveling around Spain has always held its own special charm, reminding us of that age-old wisdom that it’s not just about the destination, but also the journey. 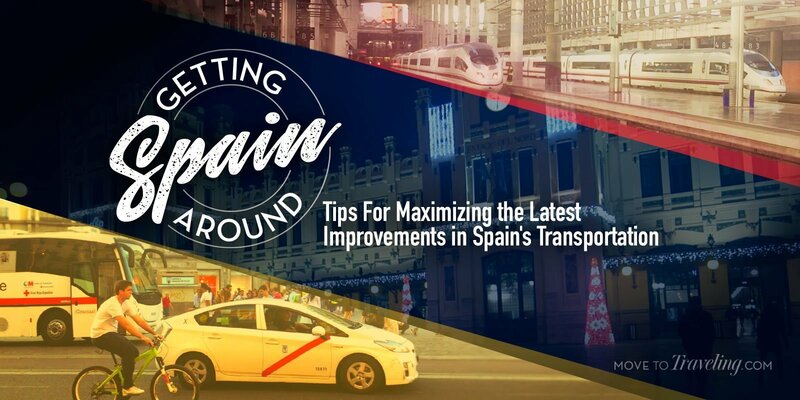 To make sure your Spain journey is the best, utilize these tips and features that will save you money and time getting around Spain. Above Image – The AVE trains at Madrid’s Atocha Station. 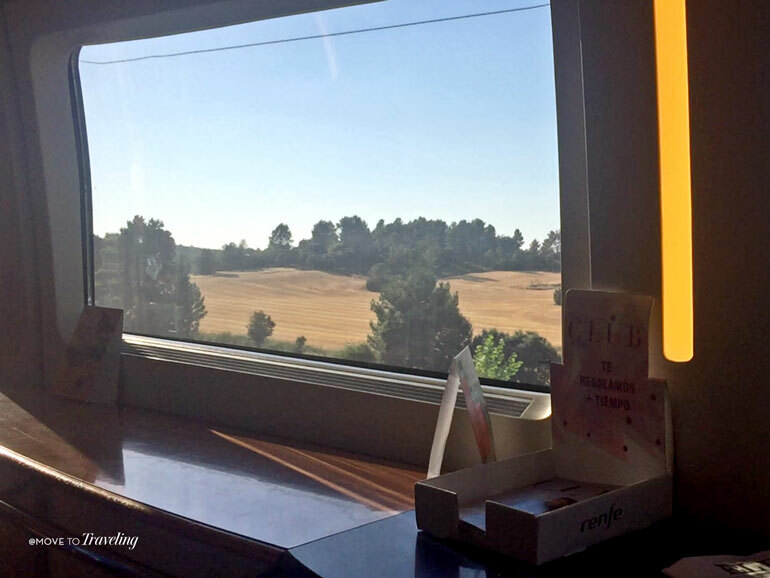 Train is our favorite mode of transportation for getting around Spain. Renfe, a state-owned company, is the national provider of the train network countrywide. The types of routes provided are suburban lines, regular lines, and high-speed lines. The suburban lines are shorter routes, which are called Cercanías and connect nearby towns to a major city. For example, from Valencia there are several Cercanías that you can take to various neighboring towns. The farthest one is usually no longer than 1-hour of travel time and cost only up to 7€ – 9€ each way, depending on the distance. Then there are the regular lines which cover longer distances but take longer. On the Renfe website they are referred to as ‘Intercity’ and ‘Regional’. These can also be quite a bit cheaper, if you have the time to spare. What is the most enjoyable though, is traveling on the high-speed train network called AVE. These connect most of the major cities and popular destinations within 3 hours. 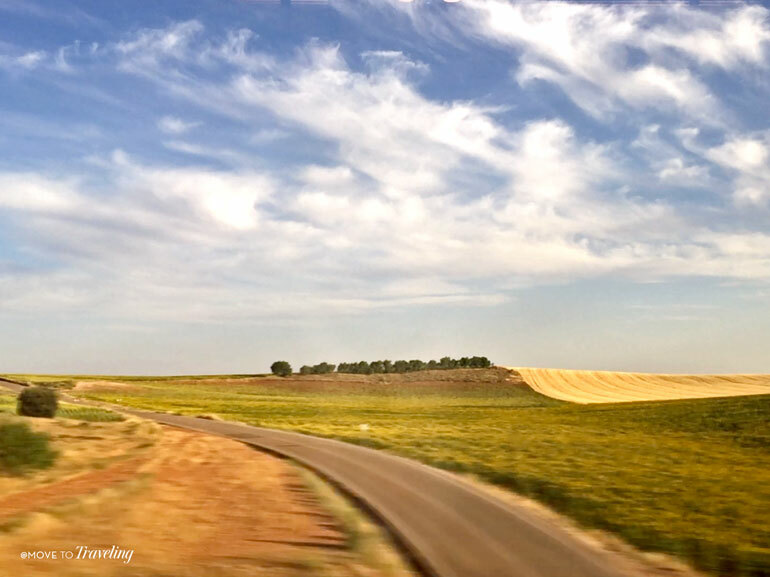 The one we travel the most is the AVE train route from Valencia to Madrid, which is less than 2 hours. The Renfe website has improved in past years and purchasing directly from them can save you money, versus buying from a 3rd party site. Take note though, that their site doesn’t take foreign credit cards for payment, but they do take PayPal. Usually it has to be a Spanish bank card, making it more ideal for expats already living in Spain. Booking on the Renfe website also gives money-saving packages. You can book a train plus hotel, train plus bus, train plus car and other options. When traveling with a group of four, you can get a nice discount if you purchase all together, because you get a set of 4 seats together that face each other. This is also really enjoyable for traveling together. If you’re living in Spain, you can get a Renfe credit card and accumulate points towards train travel. The Renfe website site allows you to create an account where you can track your trips, save travel booking data for yourself and other travel companions, and save payment methods. Purchasing tickets through Renfe provides a digital e-ticket that you can have emailed to you, sent via SMS, or can save as a PDF or physically print. The digital tickets have QR scan codes you can use on your mobile for boarding. Or at the station, use the reference code on your purchase to print off the ticket at one of the many ticket kiosks. 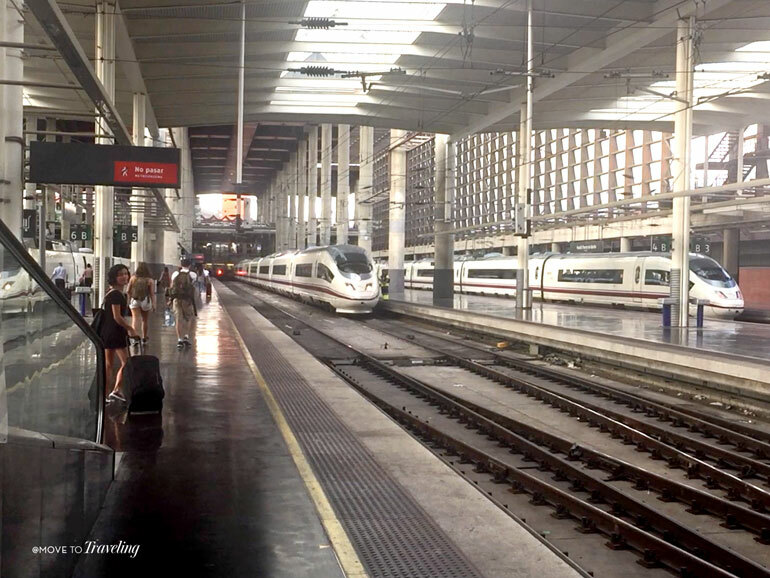 If you buy a long-distance train ticket on Renfe, you can use the reference code to also get a discount on buying a Cercanías train ticket, within up to a few hours of arriving. Yes, there’s discounts for age, depending on if you’re a child, student, or over 6o. There’s also the Renfe Spain Pass and special tourist trains that give luxurious train traveling experiences to iconic destinations in Spain. Above Image – One of the rooms inside Valencia’s Estacion Norte. As you can see, we use the Renfe website a lot. Over the years, we continue to find that it’s the best prices to purchase directly through them when possible, and they offer helpful features and discount opportunities. Another wonderful thing about traveling Spain by train, is that the majority of major train stations are also architectural sites. Even if you’re not taking the train, the Atocha Station in Madrid is a beautiful landmark and place to visit, with its indoor atrium and garden. 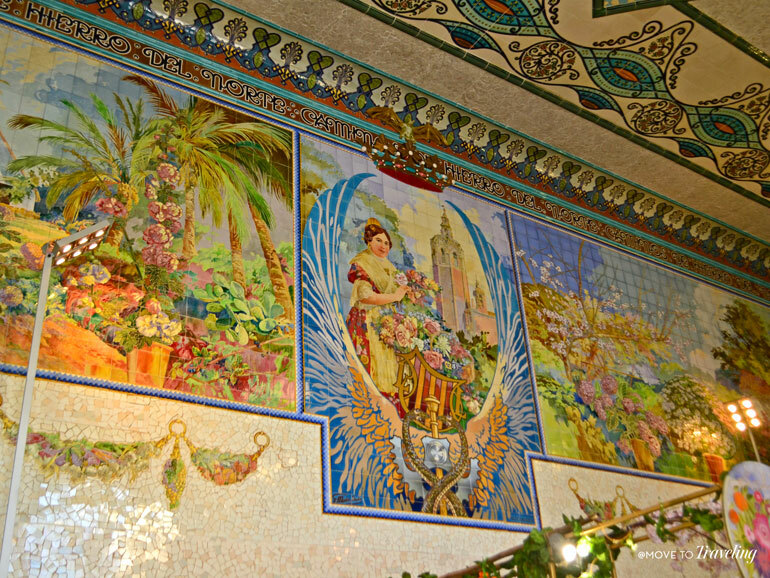 And the Estacíon Norte in Valencia is adorned with carved oranges and hand-done tile work depicting the local culture. 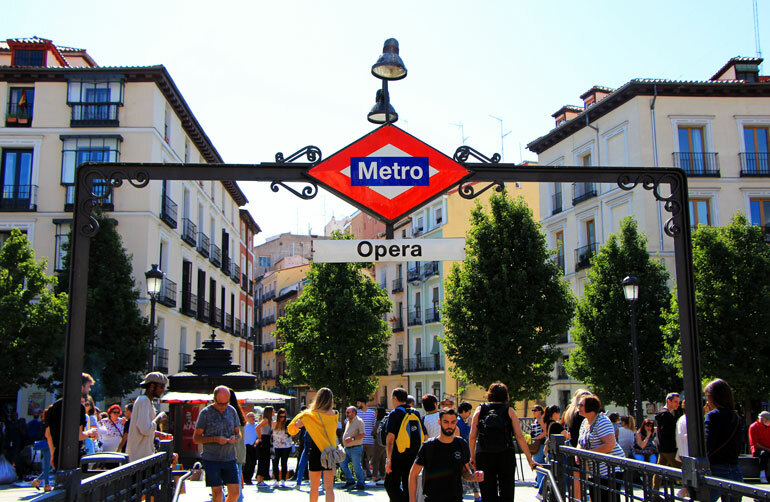 Many of the major cities of Spain have incredible metro systems, which are underground railway. The stations have very little crime and it’s easy to navigate your trip. Just follow signs for the final destination of the line that your stop is on. When you go to disembark, make sure to remember to push the door button once it lights up green or pull the lever, so you can actually get out. The metro systems also have tickets and passes that work on all other modes of public transportation, like buses and sometimes suburban train services. Taking the metro is super cheap, with the average metro line costing only 2€ in Madrid and select lines costing even less. Tickets are also discounted for abono joven (young people under 23 years old), for commuters, and for pensioners who are over 65. We’ve found that if you’re visiting Spain, the metro is usually a great way to get from the airport into the city-center. But once in the center, you may want to use bus a little more, so you can be above ground and see more. For those of us living in Spain and its major cities, the metro is even more of an ideal mode of transportation on a daily basis. 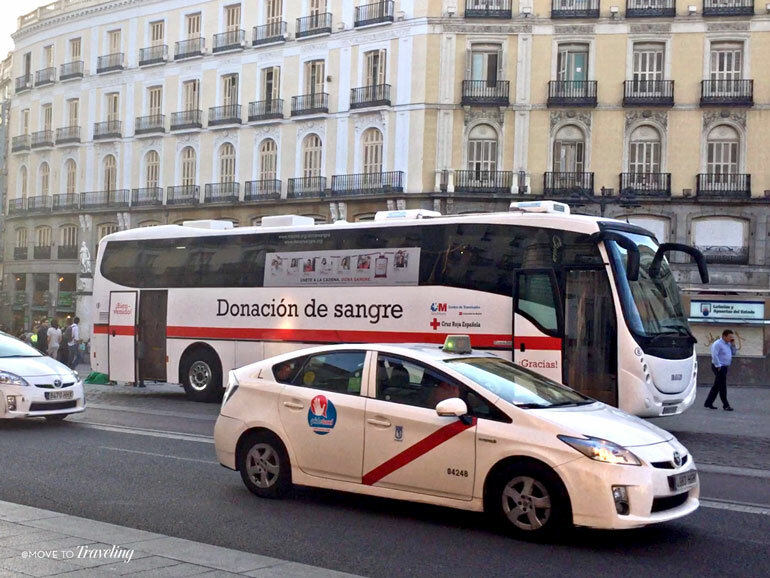 Above Image – A public bus in Madrid’s city center. Bus (autobús) transportation in Spain is quite good, and many times is the only way besides car to get around more rural areas of the country. We travel by bus quite a bit from our town of Denia, just south of Valencia, and when we’ve visited the regions of Extremadura and Asturias. Each major city, and even towns, have their own public bus system. These offer passes for saving money on multiple trips, and other discounts such as being a student or senior citizen (referred to here as pensioner). Just keep in mind that they can get pretty crowded and usually have more standing room available than seats. The long-distance coach buses (autocar) provide services between the major cities and are managed by a variety of private companies. One of the largest companies is Alsa, which is also our favorite. But there are certain areas they do not cover, such as Extremadura, where instead Avanza provides bus transportation. Some other popular companies are Damas, Hife, and Interbus Murcia which used to be Lycar. On the Alsa website, you can create an account to save your travel data and track trips. Through an online user account on the Alsa website, you can accumulate points that later can be used as credit toward future purchases. We just recently got bus tickets half off by crediting only a few hundred points, and it gave us the option to use all our points or half of them. Buying directly on the Alsa website, you get the best pricing and they’ll send your digital ticket via email or SMS. You don’t have to print the ticket and can use its QR scan code on your mobile phone to board the bus. While there are some not-so-nice buses you can end up on in Spain, they are usually quite clean and nice. Many of them, especially for longer distances, have televisions and show movies and have free WiFi (although that is sometimes not so reliable). 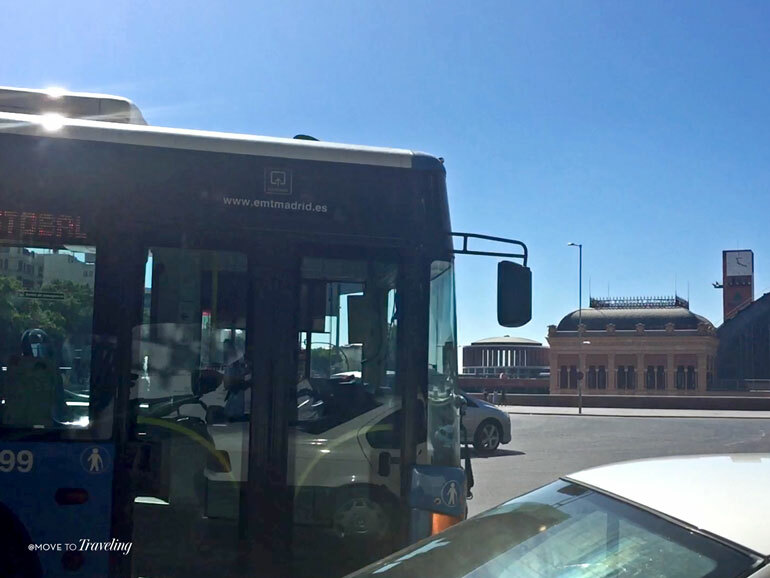 Overall, traveling Spain by bus can be a great way to go. Above Image – A Balearia ferry leaving from Denia. Taking a ferry in Spain may not seem like the most practical mode of transportation, but it sure can be an enjoyable way to travel. In the Mediterranean, the company Balearia operates routes to the Balearic Islands, all along the mainland Mediterranean coast, and even to destinations in Africa, like Tanger. The company also features newer, environmentally friendly boats that travel even faster. Visiting the popular island of Ibiza from our town Denia can be done in around 2 hours. Along the northern coast of Spain, you find opportunities to ferry to and from the UK and other parts of Europe. These routes are managed primarily by the company Brittany Ferries, which operates what they refer to as cross channel ferries. The Balearia operates more frequently in the higher tourist seasons, with the summer months being when they offer the most options. 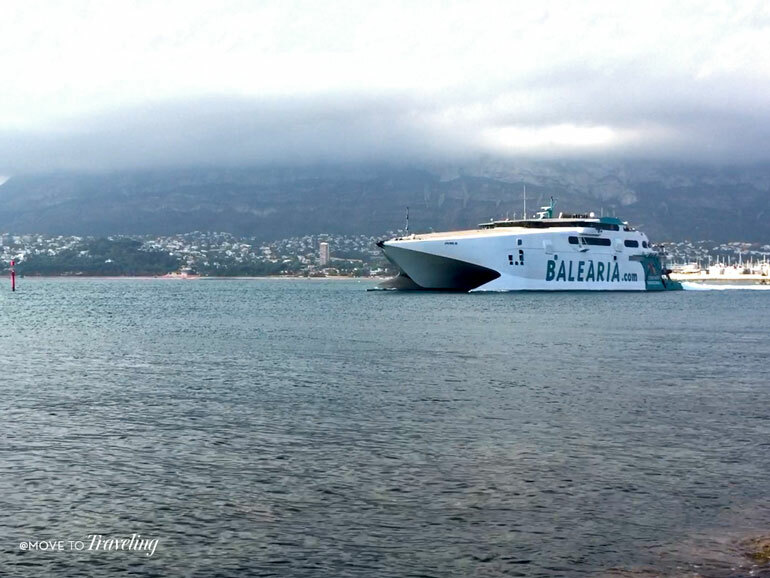 Balearia’s faster ferries are run more often in the summer months. If you are living in Spain, Balearia gives you a discount for traveling as a resident. Get a discount on Balearia for being over 60 years old. The ferries are a great way to take your car with you, especially to destinations like Ibiza where a vehicle is needed to see more of the island. The ferry companies also offer packaged deals, such as ferry and hotel. Some years ago, Balearia made Denia its world headquarters. Their main port is here, in our Marina Portet. The company’s presence makes Denia another great reason to visit, especially if you’re traveling Spain’s Mediterranean Coast. Ah, the good-old airplane. Flying around Spain can not only be a time-saver, but a money-saver as well. Don’t you just love those low-priced inner-country flights? And even traveling to other European countries from Spain, can be down-right cheap. Most flights within Spain’s mainland only take within 2 hours. Of course, you need to calculate your time getting to the airport and through security. So reality is, there are still some routes that are quicker by train, for example taking the AVE train from Madrid to Barcelona, Valencia, Seville or even Malaga. Two of the best airlines for flying within Spain are Vueling and Ryanair. You’ll want to use them for quicker travel to and from corners of the country, like from Barcelona to Asturias, or from Seville to Bilboa. Vueling airline tends to have better routes. Ryanair tends to have the cheaper prices. Watch for the luggage costs and restrictions. Many times these are smaller planes and they limit what you can take for free. And that steal-of-a-deal? You can bet it doesn’t include checked luggage or even carry-on for that matter. They might charge for both. We haven’t traveled as much by plane in Spain. There’s something about wanting to see more of the journey along the way. 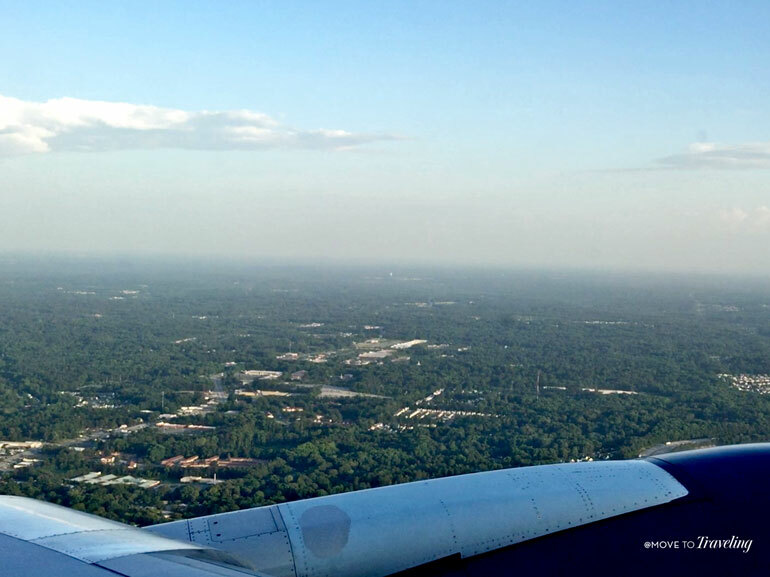 But flying to your destination is especially a great option when you’re visiting and possibly have less time. While they’re mostly convenient to use in major cities, you can also call a radio-taxi in smaller towns. It does cost more though to call a taxi versus hailing one day in the street or finding one at a taxi stop. The taxi stops (paradas de taxí) are well organized areas found at train stations, airports, bus stations, and certain major points in city or town centers. You line up here and take the next available taxi, so it’s not a free-for-all. Rates still vary depending on the region and city. In many regions, there is an initial base-cost plus the distance traveled. Be ready to go when you call a taxi, because they can charge for waiting time. Prices for taxis at night, and in some places during holidays and weekends, are more expensive. Prices can be up to 30% more. Other cab companies like Uber and Cabify are now available in Spain, but we have found that they are usually more expensive. Taxi drivers are usually not tipped. Although, you can if you want to. Recently, Uber and Cabify have been introduced to Spain, and it has really stirred things up. Just this past year, the traditional taxi drivers went on strike in all major cities. We remember because we were traveling in Madrid and Valencia at the time. It was pretty annoying because it was then that we also learned that Uber and Cabify are more expensive. Could it have been because they knew the regular taxis were not an option for us? Perhaps, and in that case, even more reason why we prefer to use the traditional taxis. It feels to us more like keeping business local, and can be the simpler and more affordable option. What a name, right? Blah Blah Car is a car-ride service that incorporates us every day drivers. It essentially monetizes carpooling. This can be a great way to travel by car and save money. Trips between major cities are pretty common and a good price, coming out cheaper than train or bus or in some cases even gas if you were to drive by yourself. This can also be a great way to travel between towns in more rural or remote areas, although in those cases the frequency can be less. The website is ok, but sometimes has issues and the browser translation can be weird. You have to have a working phone to use the service and be able to download the app to your mobile phone. Two things that may not be an option for people, especially if you’re only visiting Spain. Keep in mind that every seat in a car can be booked, so it can mean three adults squeezed in the back of a small vehicle. Do you want to be that close to strangers? Perhaps it depends on how long the journey is. Room for taking luggage is usually limited to 1 small suitcase per person, but that can vary. Details such as this are listed in the trip details, along with information on vehicle make and model and how many seats and space they have available. We’ve used Blah Blah Car twice in the almost four years we’ve been living in Spain, and both experiences were pretty good. But each trip did feel crammed and we realized we were limited with our luggage. Overall, we feel that this way of getting around Spain can be more ideal for younger people, like students, and singles (but to each their own). 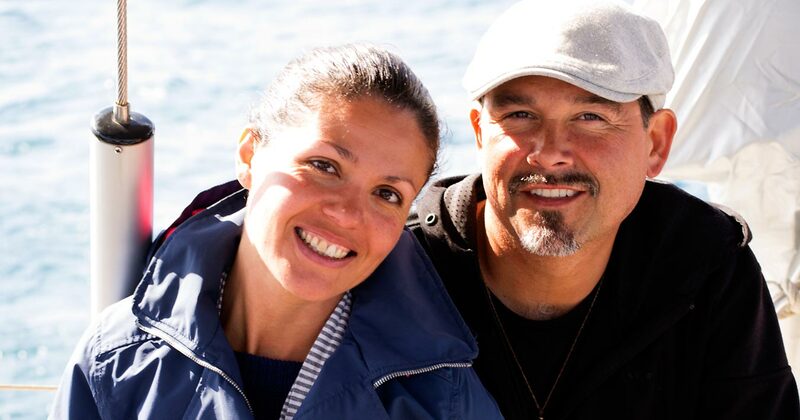 If you’re traveling as a couple or family, it can be more comfortable to go by another means of traveling. Renting a car is probably one of the most popular ways of getting around Spain, especially for visitors. Compared to other European countries, rental car prices can be very affordable. What can cost a bit more than what you’re used to is perhaps gas (especially for visitors coming from the US). But rental cars typically are good quality vehicles and have good gas-mileage, depending of course on what you get (do you really need the SUV?). The roads throughout Spain are relatively good. There are autovías, which are distinguished on signs by an ‘A’ and are single-laned expressways that usually parallel larger highways. They can be a little rough and not in as good condition as the autopistas. The autopistas, which are ‘AP’ on road signs, are multi-laned expressways that charge tolls (these can be pretty pricy), and they’re in very good condition and have less traffic. Then there are also national roads, identified by ‘N’ and regional roads, identified by ‘C’. When visiting major cities, consider if you want to drive in the busy, hectic traffic. There’s limited, expensive parking and in coming years cities like Madrid are limited the amount of vehicles that can drive in the city-center. This can cause some serious stress during what is supposed to be a good and relaxing time. When visiting old-world towns and villages, keep in mind that streets can be crazily narrow or steep or both, so think about what size vehicle you’re renting and if you want to put yourself in that situation. If you’re coming from the US and plan to drive in Spain, you actually should get the International Driver’s License (IDL) before coming. You can get this at a variety of places, such as an AAA office or from your car insurance provider. Don’t worry – you don’t have to take a test, it only cost around $25 and can be processed in a matter of days or quicker. This is then provided to you as a piece of paper that you carry with your driver’s license. Rental car companies will not ask for this and don’t care if you have it or not, but if you get stopped by the police, they will most likely care. Driving in Spain as a foreigner, you must make sure to have your valid passport with you, as well as your driver’s license. If you are moving to Spain and are from the US, your US driver’s license is only valid for 90 days. After that you have to get a Spanish driver’s license. And no, you can’t exchange your US one for a Spanish one. Remember that most cars in Spain are manual, which can be different for those us coming from the US, where the average person only learns to drive an automatic. While rental places may have automatic vehicles available, it is usually very few (so they get booked up quick) and they cost more. Going back to those autopistas, the one here in the Valencia Community is going to take away it’s tolls starting the end of 2019. So if you’re driving around Valencia any time after that, you won’t have to pay those high tolls. In our time living in Spain, we have not driven and we still do not have a car. While one day we’ll get a vehicle, we do not miss the stress that can come with it and the extra cost. At the same time, if you’re moving to Spain, you can consider doing what friends of our’s do. Having moved to Denia from Denver last year, they rent a vehicle for 3 – 4 days about once a month. This is when they plan to do shopping for bigger items or at stores further away, and explore the surrounding area. It works out great because it’s a ridiculously cheap price of only 12€ a day, and they pay for a car only when they’re going to use it. Above Image – When traveling by train, don’t forget to enjoy the bar car! It’s great to see the improvements that Spain’s transportation has achieved. We have high expectations that it will only continue to expand in positive ways. Many of the best ways to save money and enjoy more benefits is to purchase directly from the company. Even the long-existing stereotype that everything in Spain is late, doesn’t apply as much any more when it comes to especially the public transportation. Things actually leave on time. And thank goodness that the websites are finally getting better. Many still have a long way to go, but it’s a big area of growth for many Spanish companies in the transportation and travel industry. More than anything, your choices for getting around Spain will be most influenced by whether you’re visiting or living here. Take this into consideration when making your plans and you’ll enjoy not only the amazing destinations that Spain has, but the charm of the journey as well. Have a great time getting around Spain! What have been your favorite modes of transportation for getting around Spain? We’d love to hear about your experiences. Or ask any questions and we’ll help you find the answers. Another great and very useful article! Thanks. In all of our travels to Spain, we have used all forms of transportation except the Blah, Blah, Blah and I don’t think we will try it. It remains me of my days growing up in Puerto Rico sharing a “publico” We love the AVE as well as getting around the City using the Taxi Services. 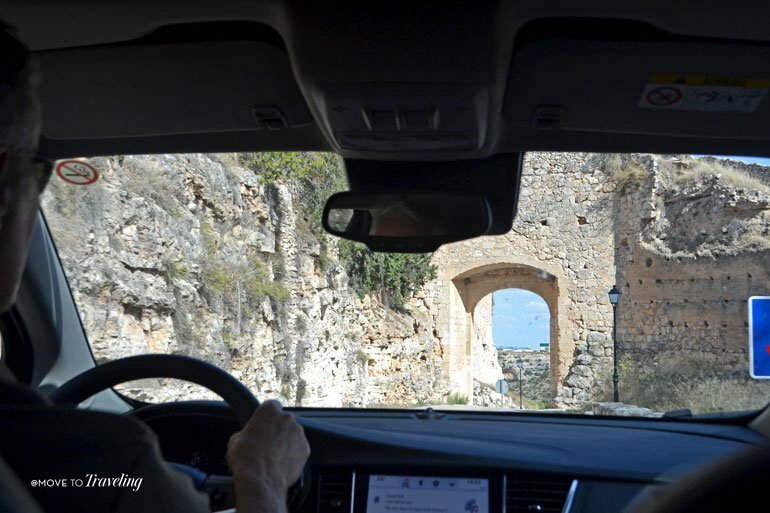 Our travels to Spain tend to be for more than a month time thus we prefer to always rent a car as it gives us the time and needed the flexibility to move around. On the subject of getting a Spanish driving license, this will be a must for us and we will have to muster the cost of acquiring the needed permits which I understand are quite expensive, a jaw-dropping around 1,000€ per person!!!!! We’re so glad Lionel, that you found this article helpful. Thank you so much! And that is really neat to learn that you grew up in Puerto Rico. In the Dominican Republic, where Amalia’s mom is from, they have ‘publicos’ as well! So we know what you mean. And yes, it is a bigger investment of money and time for getting the Spanish driver’s license. If you don’t pass the test the first time, it cost to take it again, and each time until you do pass it. Amalia’s mom had to take the test 3 times and by the end spent almost 2000€! Not to freak you out about the test. There’s a variety of companies here in Denia that provide the classes you have to take for it. We don’t know enough about them to recommend any right now, but will keep our ears open. Love hearing of all the ways you’ve traveled around Spain! And very much look forward to hearing about your future adventures and life here. Thanks again for reading.